Easy 30 minute recipes for weekday cooking - Blog - How to Cook Perfect Bacon – It’s Easy! How to Cook Perfect Bacon – It’s Easy! Boiled or smoked, dried or fresh, it’s mighty hard to come across a bad slice of bacon. But there is such a thing as the best bacon and it’s all in the preparation. Don’t get me wrong; starting with a quality product is always the way to go, on both sensory and ethical grounds. But I’ve happily chomped on some decidedly mediocre bacon in my day and the lowest common denominator is that cured pork belly = gooood. In order to identify the method best suited to bacon, I spent an afternoon broiling, sautéing and frying my way through a few packages of the stuff. In the end, my kitchen was covered with a fine film of lard and I can only imagine the damage to my arteries, but the best-prepared bacon was a clean winner. Bacon is at it’s best when the striations of fat between the meat have ample time to dissolve. The direct heat of stovetop cooking invites overcooked meat and undercooked fat, plus it keeps the cook chained to the stove. A moderately heated oven, however, provides that slow sizzle; the fat bastes the meat as it melts then pools beneath the rack, moistening the strips without making them greasy. As if perfectly crisped bacon wasn’t enough, this approach frees up the stovetop and requires minimum attention, as one can’t live on bacon alone…? Heat the oven to 325 degrees. 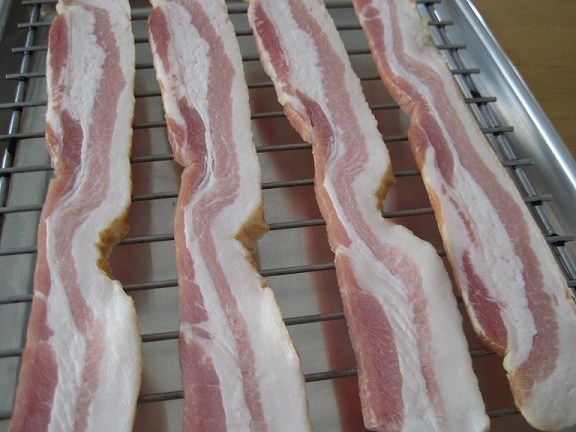 Place strips of bacon in a single layer on a broiler pan or a wire cooking rack over a baking sheet. Bake until well browned and crispy at the edges, but still pliable, about 25 minutes, depending on thickness of the bacon. Flip thicker slices once during cooking. Funny that I had never thought of cooking bacon in the oven, but only on the stove top or microwave, the later a practice that I never use. The oven approach sounds fantastic, particularly if the pan underneath is lined with aluminum foil (which I'll recycle) to make the cleaning duty easier. Can't wait to try it. Thanks! I've tried it and it works perfectly! Another great thing about cooking it this way is that you can cook more at once than you can in a frying pan. Great idea to line the pan with foil for quick clean-up! I also like to whisk a tablespoon or so of those nice drippings into a vinaigrette...mmm, bacon.